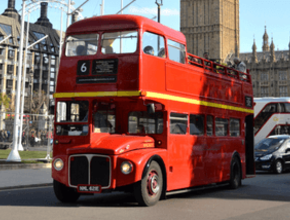 With calls of ‘all aboard’ welcoming passengers to take a seat on a restored vintage bus, groups will be chauffeured around the stunning sights of the big city, enjoying a unique viewpoint of the festive streets. 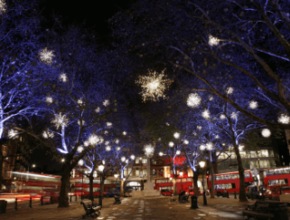 Troupes will pass under the world famous lights of Oxford Street, Regent Street and Knightsbridge, illuminating faces from above and almost close enough to touch. All the big names will make an appearance including the likes of Big Ben & Lord Nelson himself at Trafalgar Square. You will also enjoy a photo stop at the all-seeing London Eye. The two and a half hour tour includes live commentary from an expert London guide, instilling capital knowledge along the way. Please note that the Christmas tree at Trafalgar Square dates are to be confirmed. In exceptional circumstances an alternative vehicle (a closed-top vintage bus or a coach) may be used. Please note that seating on the upper deck is not guaranteed. Consumption of food and drink is not permitted on the vehicle.